Demand for websites continues to grow at a steady pace. As more people find interest in writing and diverging their professions to sub-categories, a website is a wonderful way to maximize exposure to new clients and readership. In marketing, a website acts both as an informational resource, and as means to generate revenue. Of course, revenue isn’t something that you see appearing instantly. Growing a website and a community can be a very time-consuming process, and often requires great commitment to reap the rewards of success. Ask any successful blogger, and he will tell you that unless you write consistently, your blog is going to fade away. But, before you think of starting a website, and indeed a blog, you are going to have to figure out how to create your website. These days, website builders are a dominant choice for beginners. But, WordPress, a professional content management system, provides much more ways of personalizing a website for special needs. We recommend WordPress simply because it is the best. You can’t put a price on thousands of free website designs, and thousands of more website plugins — also known as add-ons. With so many free tools and cheap hosting just one click away, WordPress invites beginners as it does professionals. WordPress can be as cheap or as expensive as you want it to be. Thanks to the introduction of premium themes and plugins, WordPress can be turned into a business venture itself. And many have taken the opportunity to build premium themes for a nominal fee. Certainly much cheaper than hiring a web developer, with costs exceeding tens of thousands of dollars for a custom design. As a beginner, you don’t have to trouble yourself with such ridiculous sums of money. Instead, you’re much better off by choosing a free theme. 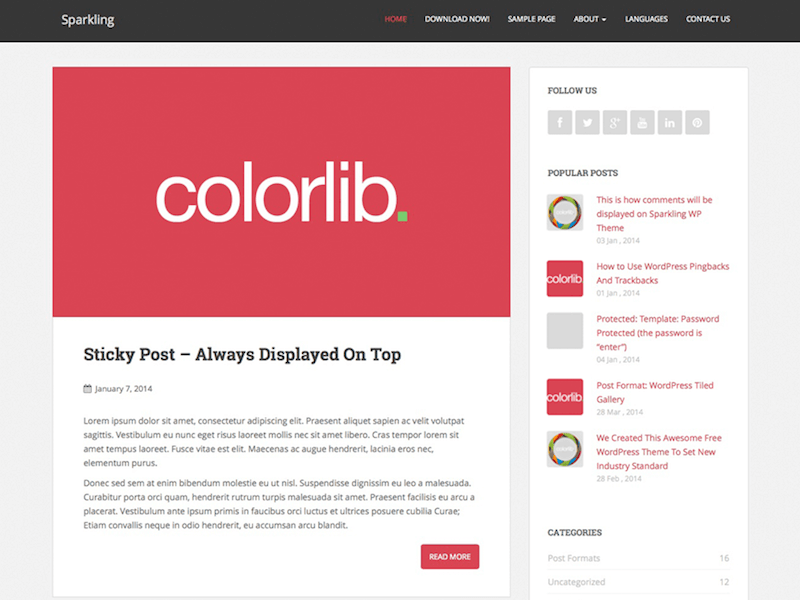 In this case, we have compiled a compendium of best free WordPress blogging themes. Take as much time as you need to preview each one. Who knows, your next website design could be on this list! Newspaper X is our latest free theme release and makes our total of published themes to number ten. Along the way of publishing some of the nicest themes (according to individual reviews), we’ve learned what it takes to build a theme which works well. 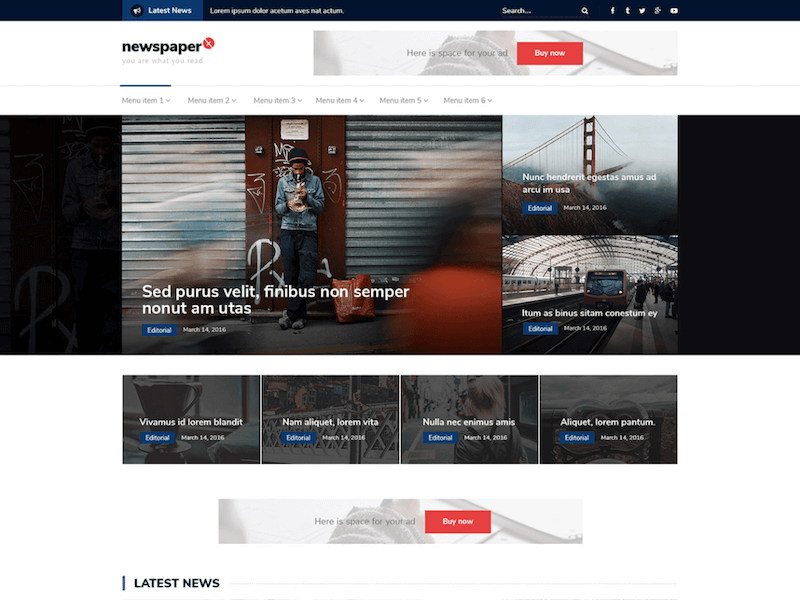 The Newspaper X is a polished blogging theme with multiple magazine elements. The core principle behind Newspaper X is to highlight as much new content on the homepage as possible. As a result, you can add numerous layers of content categories on the homepage. Which creates a newspaper like atmosphere, and focuses on readability rather than things like widgets. Apart from the footer area, you won’t find any widgets on the homepage. However, you won’t need them because Newspaper X adds additional ways to highlight any content you want. A tidy content slider is integrated into the upper part of the homepage to display featured posts. And just below the slider is an added grid where you can put any fundamental content. Content display is mostly shown within a two-column grid, with ample spacing between each post. Colors are simple, with lots of dark colors for titles, and grayish tones for taxonomy information. Inside blog posts, the main design change is the addition of a sidebar. Although we primarily market Shapely as a theme for businesses, countless WordPress bloggers have turned Shapely into a blog theme. It’s something we’ve noted in the documentation ourselves. A theme as versatile as Shapely is easy to configure for personal needs. With an unmatched design, we know that Shapely is one of the most advanced themes on the free market. And numbers don’t lie, with WordPress reporting more than 20,000 active installs. We know the number is much higher than this, as the majority of our theme downloads happen in our own Theme’s section of Colorlib. The detachable homepage elements of Shapely are easy to move around, enabling you to revamp the homepage into a personal blog style. Many bloggers have recreated their sites by putting business aspects on the homepage. For example, WellnessMama used to be a blog-only website, whereas now the owner has put a lot of sales/business elements on the homepage. And the blog is relocated to the Blog section of the site. So, given that example, you can use Shapely to achieve the same result. Needless to say, the Blog layout of Shapely is pristine, with clean colors and typography, making it a great blog them on its own. 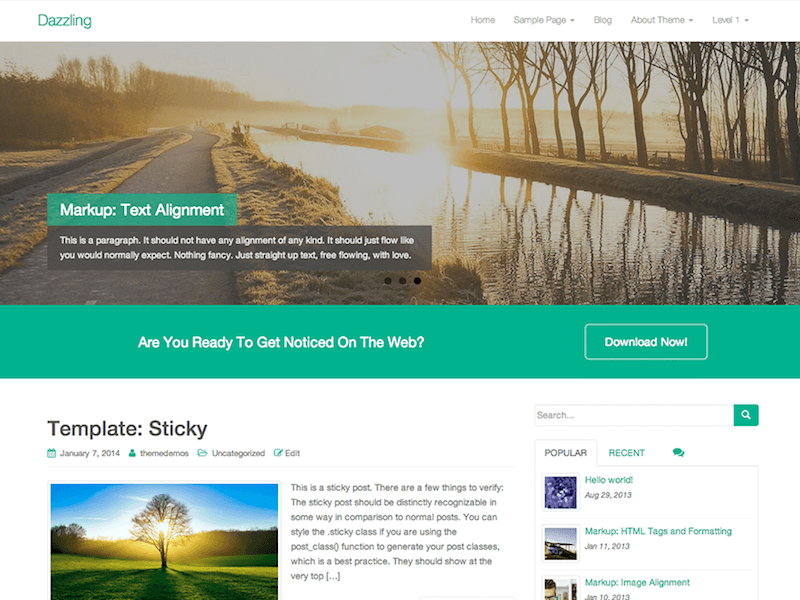 All of our free themes started out slowly, but over the years the WordPress community has come to embrace our attentiveness to detail and precision. 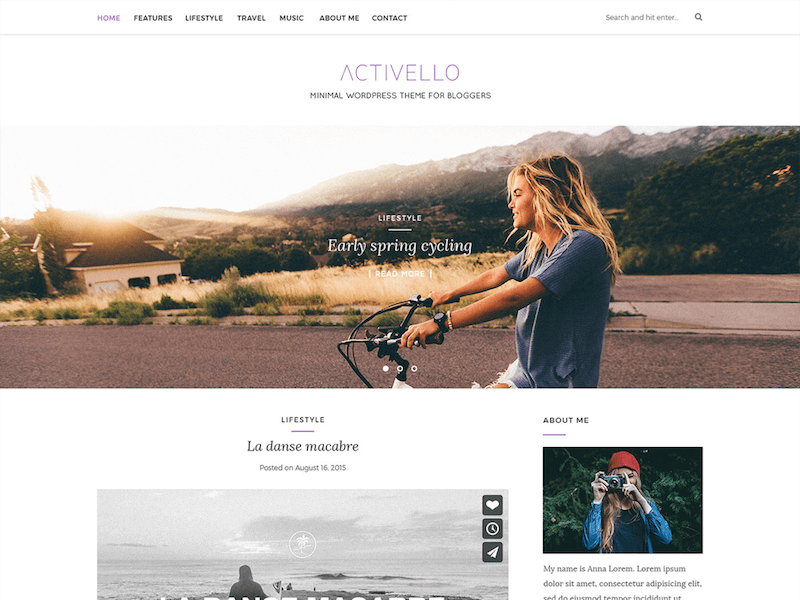 And Activello — a simple multipurpose theme — is a prime example of a simple theme can attract hundreds of thousands of users. Professional bloggers, travel writers and fashion designers are just a handful of people who use Activello for their blog. This minimal yet refreshingly clean theme is everything you’d need to create a trending content blog. With an aesthetic arrangement of components, the Activello can help individuals like you to create a personal brand out of your blog. As avid WordPress users ourselves, we know what it is that a theme needs to make it complete. And one of the most important things for a theme is compatibility with external plugins. As such, the Activello theme is suitable with plugins like WooCommerce, Yoast, Jetpack, Cache Plugins, and Gravity Forms. You know, the usual suspects of the best WordPress plugins for a blog. Furthermore, Activello uses Schema Markup for posts and pages, so you can get a decent SEO boost as soon as you start using this theme. Most of all, our communication channels are always open, and we’re delighted to hear from users who would want to see new featured added to this already powerful theme. It’s been unreal to watch Sparkling rise to the top as possibly the best WordPress theme ever built! Would we exaggerate a claim like this for our own benefit? For several months now, Sparkling theme sees anywhere from 500 to 1,000 daily downloads. The clean and modern nature of Sparkling has truly found its “spark” in the community. The Sparkling theme is a responsive and minimal WordPress template for bloggers in all niches. Health experts, marketing professionals, and travel bloggers are just a few of the people who rely on Sparkling for best content performance. With a powerful Bootstrap 3 integration, the Sparkling can handle anything a browser would ever throw at it. Structured to include the least amount of junk, Sparkling manages to provide a handful of powerful features. For example, once you go through the process of downloading and activating the template, you can start to dig into the juicy features. One of our favorites has to be the advanced menu. For the menu, we use Nav Walker — a dynamic Bootstrap menu feature with which you can add custom styling and font icons. The feel of using font icons in a placement like a menu is totally different from what you’d normally see on a blog. And if you seek to make your website to feel like a true home to your community, a little bit of visual spice is the way to go. 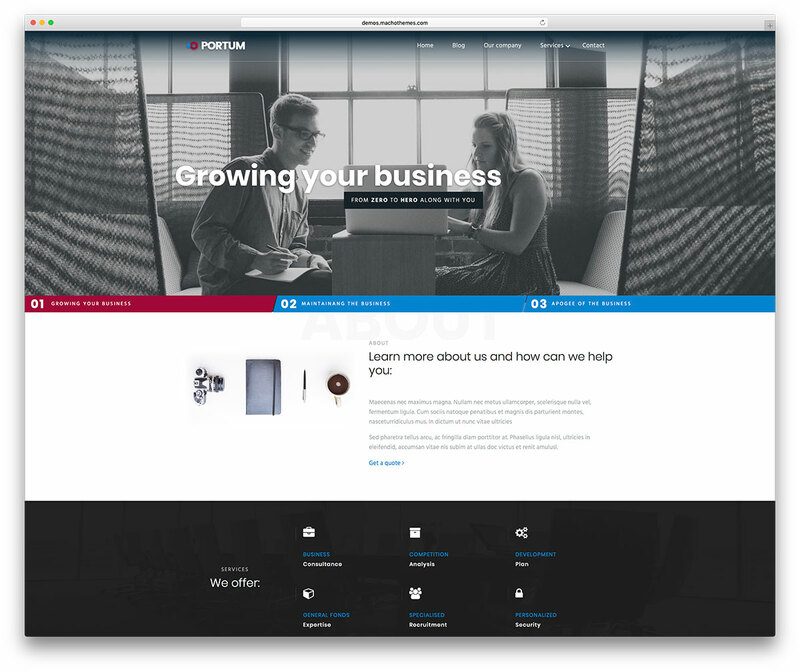 Portum is a clean and simple free WordPress business website theme. It’s the perfect tool for taking your business projects and ventures online in a flash. You’ll need no prior coding experience to do right by your business with Portum. Polished, high quality websites are a breeze to create through Portum. The awesome WP Customizer lets you craft whole sections and layouts like a pro. Handy shortcodes allow you to drop functional elements anywhere on your pages. Introduce your professional team and present your qualifications in style. Attract new business with handsome and flexible pricing tables. Present your products and services in the best light and make the right impression. Businesses large and small can find a home in Portum. Broad plugin compatibility lets you expand Portum beyond your wildest dreams. Get Portum today, and let your project make it big! The last blogging theme from our own catalog is Dazzling. A fast performing blog theme which uses jQuery and Code Optimization for super fast loading times. Unless you have been living under a rock for the last few years, you should be well aware that Google monitors website performance, and counts it as a signal towards SEO rankings. So, if blogging is your thing and you want to do it frequently in order to grow your brand, then Dazzling can accommodate you effortlessly. Most of the Colorlib themes rely upon Bootstrap 3 for styling, and so does Dazzling. The thing about frameworks like Bootstrap 3 is that they do most of the hard work for you. For example, a Bootstrap-built website is always going to be responsive. And, you can easily style your site by changing only a few lines of CSS. Speaking of which, if you’re inexperienced with coding, you can still enjoy Dazzling to the fullest. How? Dazzling has its own Theme Options dashboard, which can be used to edit colors, add new sliders, or customize which kind of fonts you’re using. As a blog theme for food bloggers, the Kale gets its name from an appropriately named plant — Kale! This gorgeous, and super smooth theme is “stuffed” with features to make food blogging easy, and fun. Lifestyle bloggers, as well as those who blog for personal reasons, can still enjoy Kale as an alternative blogging theme. Kale supports WooCommerce which you can use to build your very own online shop! Food bloggers have so much to offer and often decide to go the route of a personal food brand. That being said, Kale isn’t just a theme to solve a temporary problem. Eventually, you can configure Kale so that it lasts you for years to come, whilst having an up to date design to match trending standards. Your published content is automatically SEO optimized, and adding an additional SEO plugin is further going to increase your exposure on search result pages. 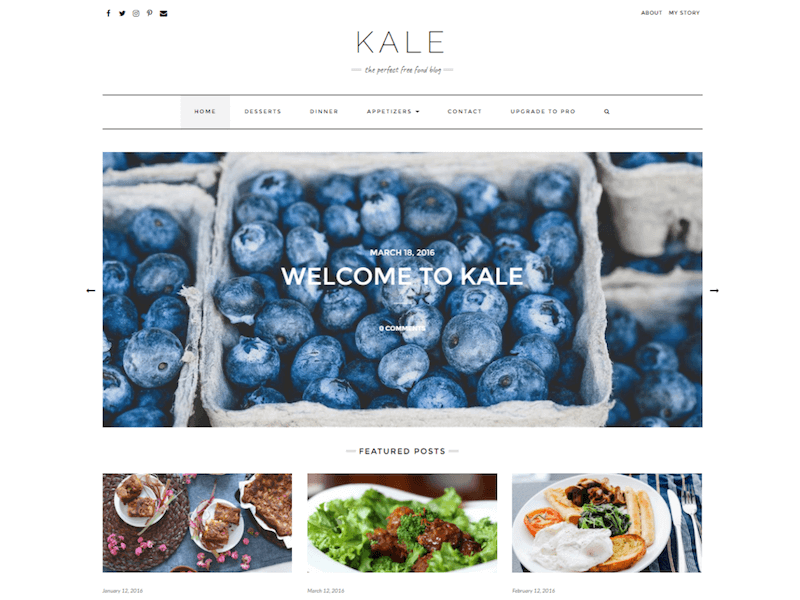 The front-page of Kale theme is the one part of the whole design that has gotten a lot of love and attention. With a pleasing placement of sliders, content boxes, and blog post lists, you can rest assured that readers are going to see what you publish immediately. 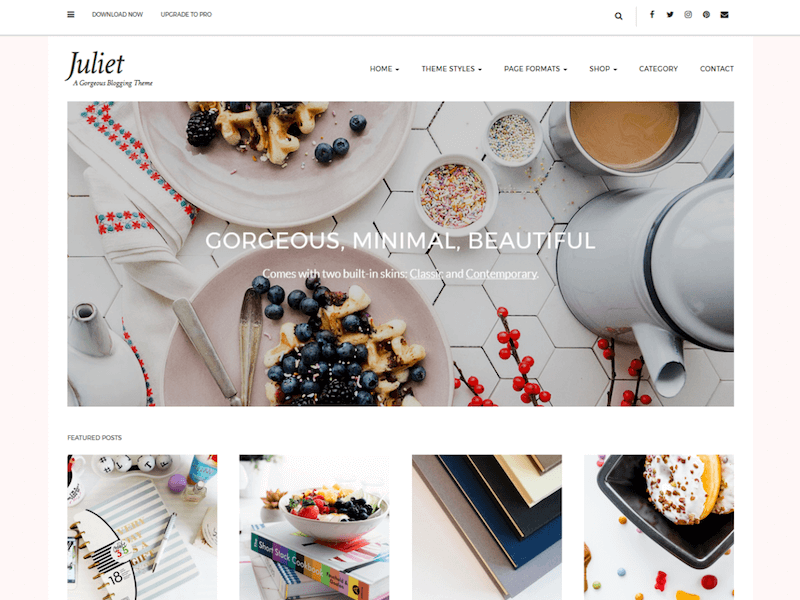 Juliet is a feminine-style blogging theme for lifestyle, personal, and fashion blogs. With a smooth scrolling optimization and two included skins, Juliet is more than enough to create a stylish and trending blog website. Once you have the basics of your blog features figure out, you can go ahead and enable your eCommerce store. Of course, the store pages are pre-designed, and you can add products straight away. The widget areas of Juliet are exceptionally well positioned, allowing bloggers like yourself to maximize exposure to what is important to you. Most of all, Juliet is simple to use and when you want to change something, it can be done without the strain of needing to know how to code. Currently, the Juliet theme consists of features like fancy scrollbars, sticky posts, responsive design, front-page banners, featured posts, and blog feed widgets. 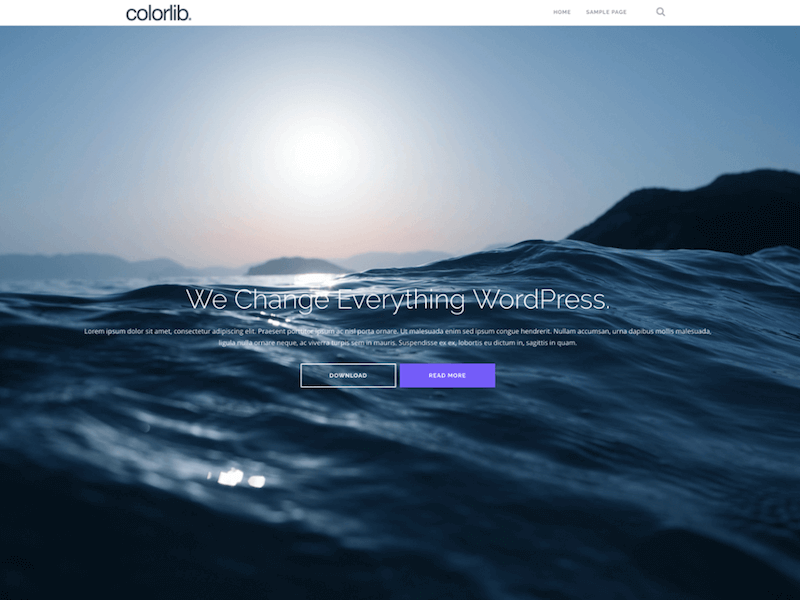 WordPress community is in love with ColorMag — a theme that has been consistently updated and kept in good maintenance by ThemeGrill. It’s one of their better themes for sure, and not without a reason. 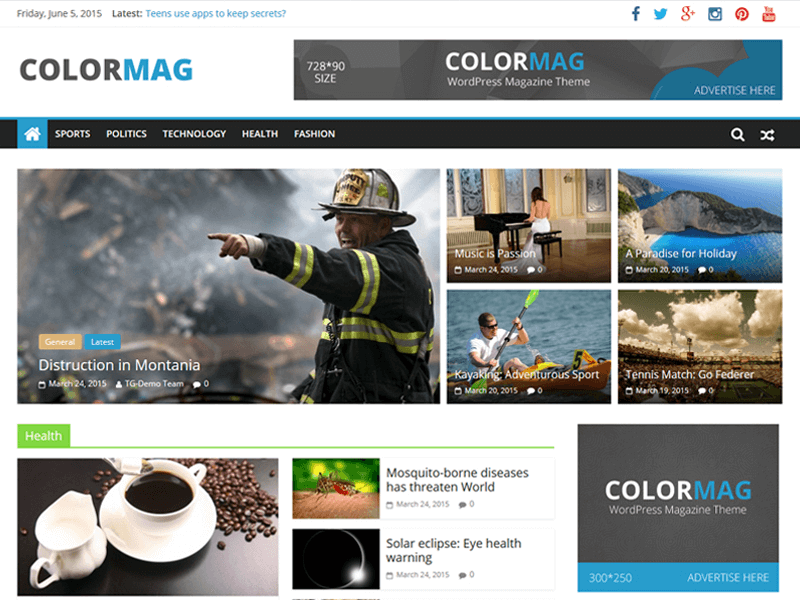 ColorMag is a stylish magazine theme which is available as a Free version, and a paid Pro version respectively. A magazine theme can mean many things, but ThemeGrill clearly states that you can use ColorMag for news, magazine, and publishing websites. As a result, the intended use matches the provided features. While we won’t go into detail about all features of ColorMag, we’d like to mention some that would be important for a blogger. First feature is a dedicated magazine-style layout, which focuses on attracting readership to your content. Something that we haven’t really seen before is a “unique posts system” developed by ThemeGrill. The posts system scans for any possible duplicate posts within your widget areas, ensuring that every single link on a page is totally unique. And because you get more than 15+ widget-ready areas in total, it’s definitely a welcome addition.